One of the best parts of fall harvesting is the baking that follows. In the last couple of weeks, I’ve been freezing lovely orange bags of butternut squash and also lighter orange bags of pumpkin. I saved aside enough to make both butternut squash bread and pumpkin bread, and it was a great pleasure to serve it to my family. This year, our apple tree bore fruit for the first time. The tree bore so much fruit that some of the limbs broke off. I probably should have thinned the apples out so there was not so much weight on the branches. The apples were sweet and crisp, but much smaller than a normal apple. They were about half the normal size, so I had my doubts before I actually tasted one. Small or not, they were great for baking. I made Apple Cake with Caramel Icing. The recipe was very easy. The caramel icing is cooked, but it was also fairly simple. The cake is moist with a subtle apple taste. The caramel icing flavor blends perfectly. Any extra effort to make the caramel icing was well worth it! 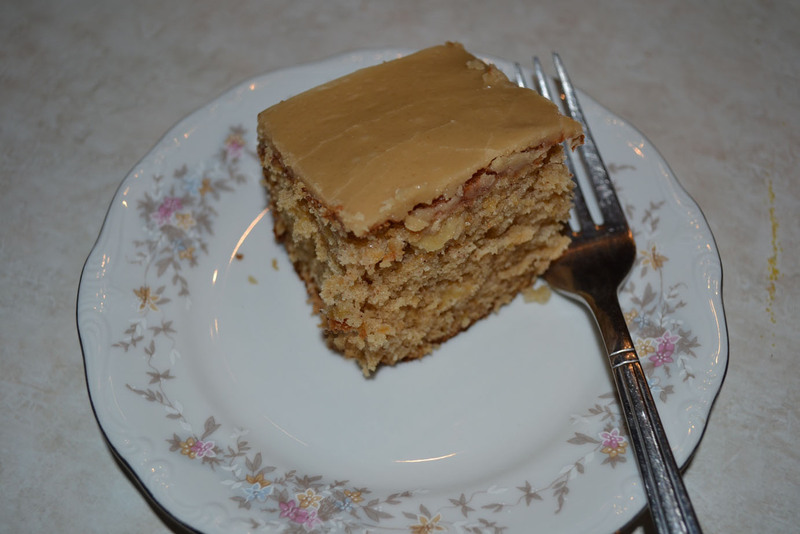 I posted the recipe on the Simple Life website – Easy Apple Cake with Caramel Icing.